We use Peekko for chatting. For the beginning we have one common chat-room. We can easily make sub rooms if it gets too narrow later. you can drag the upper orange bar with your mouse to make peekko cover as much of the screen as you want: All of it for hot chats, just the last line to keep an eye on it while working on wiki. you can make peekko run in the background and close the chat-window by clicking hide or the “-” minus in the right of the upper orange bar. You still hear a clicking sound when somebody writes to the chat as an unobtrusive information about chat-activity. 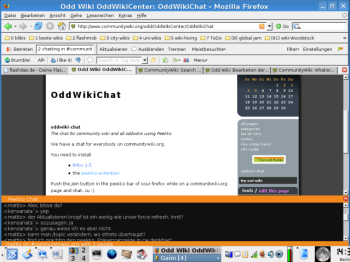 You can as well use an irc-client to chat. Configure it to irc.peekko.com and use port 8080 (that’s not the default port). Type /list to see the available chanels or /join #http://s4560.gridserver.com to join our channel.